The more the merrier applies to a holiday open house. That’s why you want to consider the timing. Christmas Day, later in the afternoon is a good zone. Same for New Year’s Day but Christmas Eve might be too hectic for some people who are dealing with last minute details of their own holidays. Of course, there is always Festivus, which is the night before the night before. Everyone would be up for that open house! Open houses are typically held during the day. So a Saturday or Sunday is best. You can set the time frame from 1 to 6 and that should work for a lot of people. If kids are going to be part of the party, then you should set up a kid zone in a back room. All they’ll need are some games, movies and snacks to keep them happy. If they’re on the younger side, then you might want to hire a babysitter to watch over them. Give the parents a break! The menu for a holiday open house should be totally no-fuss. That means finger foods and appetizers. It should be all about warming things up as opposed to baking from scratch on the day of the party. You can make it even simpler by having a potluck open house. You set the theme and the rest your guests fill in. At the very least, you can accept desserts. Everyone will haves some Christmas cookies to share. 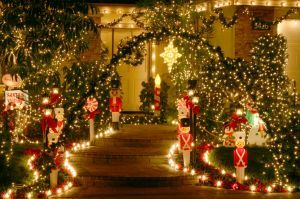 Your home will already be decorated for the holidays. What you want to be cautious about is any breakable keepsakes. Just consider the “traffic” flow of your guests. Also know, an open house is just that, open. It will be hard to lock off areas of your home. That means clearing the clutter from every room. Instead of taking that task on yourself, turn it over to Junk King Worcester. They’ll provide you with a pair of expert movers who can quickly remove any old furniture, appliances, clothing or e-waste. Think of how great your home will look after Junk King Worcester has worked their magic. Perfect for your holiday open house. This entry was posted in Worcester Junk Removal and tagged clutter, holiday open house, Junk King on November 30, 2017 by Junk King. Last updated December 4, 2017 .